With the Goodfish Group’s organic growth occasionally boosted through acquisitions, they are rapidly becoming a strategic partner for more and more international clients from a wide range of sectors, including Tier 1 automotive, electronics, medical and international OEM’s. Their in-house toolroom, tooling design, mouldflow analysis and rapid prototyping help customers across a wide range of sectors to bring new products to market faster. Goodfish currently operate from three facilities in Loughborough, Cannock and Worcester, with a fourth plant coming online in Slovakia in 2019. An ongoing strategy of investment within the group, includes the replacement of older machines acquired through acquisitions. 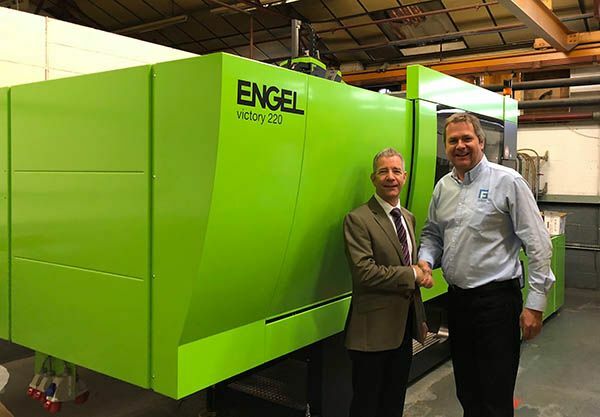 It is at their most recent acquisition, in Loughborough, where older machines are being replaced, most recently by four ENGEL Victory Tie-bar-less machines ranging from 220-400 tonnes, with integrated robots. Goodfish Chief Executive Gregory McDonald says “Raising quality standards and continuous improvement are core elements of our business strategy. Our Continuous Improvement Team works across all three sites to ensure sustained momentum in driving costs down by eliminating waste wherever possible. These new machines are part of that programme”. The ENGEL Victory tie-bar-less injection moulding machine is the optimal machine for all-round applications and a variety of technologies. ENGEL tie-bar-less technology provides absolute flexibility for complex, innovative, mould designs, rapid mould change & unobstructed robot movements.